Signed with monogram TP lower left. Although this portrait has sometimes been claimed as the original study for which Byron sat in June-July 1813, a letter to Scharf from the artist's son, Henry Wyndham Phillips, makes it clear that it is a copy painted in about 1835: '... it is a replica of the upper part of the picture which is now in the possession of the Earl of Lovelace, and which was purchased by the Lady Noel who after a time shut it up in a case and bequeathed it to her granddaughter "Ada Byron" when she married or came of age. When Lady Lovelace married, the case was brought to my father's house where it was opened, and where shortly afterwards I saw him paint the picture which I now beg to submit ...' (letter from H. W. Phillips 7 February 1862 in NPG archive). Phillips does not explain why it had been sent to his father's studio but presumably the reason was either for a copy to be made (possibly the John Murray copy) or for the purpose of restoration after its lying for years in a packing case. Ada Byron married at the age of 19 Lord King, later Lord Lovelace, 8 July 1835. The original portrait descended to her great-grandson Lord Lytton, was bought from him by the Ministry of Works in 1952 and is now in HM Embassy Athens (GAC 1976). It was cleaned and repaired by the NPG staff in 1982 and the two were exhibited side by side in May-August 1982. The NPG replica remained in Phillips's studio until sold by his son to the Gallery in 1862. A copy (1840) is in John Murray's Byron Room at 50 Albemarle Street. 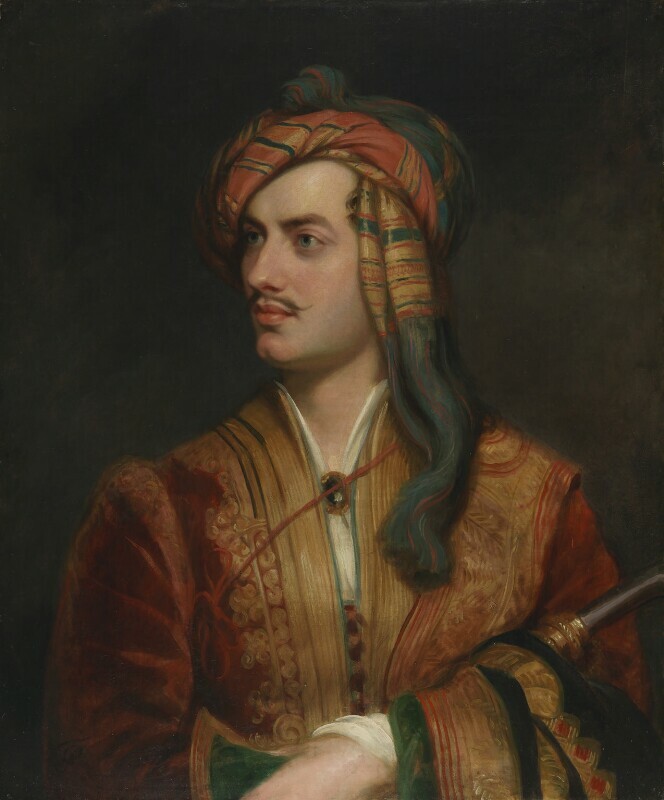 Byron bought his Albanian costume (more properly 'Arnaout', a specific Albanian tribe) in the Epirus in 1809 (letter to his mother from Prevesa 12 November 1809) and sat (or rather 'stood' as he told Lady Melbourne) to Phillips in June and July 1813, probably at the request of John Murray. Two types emerged - that standing in Arnaout costume, of which three versions by Phillips exist, and the seated type wearing a blue cloak of which four versions exist. In September 1813 Byron wrote to Phillips urging him to finish a cloak type as Murray was anxious to have it engraved, and by March, although at Hobhouse's suggestion some adjustments to the shape of the nose were made in the cloak type, the Arnaout portrait was finished: '... the Albanian wants nothing' (letter from Byron to Phillips 6 March 1814). But Byron's journal records a sitting the following day: 'at three sat to Phillips for faces'. Hobhouse gives his opinion that none bore the faintest resemblance to the poet. Dallas also says: 'in Phillips' picture the expression is one of haughtiness and affected dignity never once visible to those who ever saw him'. Hazlitt, reviewing the RA exhibition of 1814 in The Morning Chronicle, described no.84 ('Portrait of a Nobleman' but of course known to all) as 'too smooth, and seems, as it were, "barbered ten times o'er" - there is however much that conveys the softness and wildness of character of the popular poet of the East' (Complete Works, vol. 18, pp 18-19). Leigh Hunt however thought it: 'by far the best that has appeared; I mean the best of him at his best time of life, and the most like him in features as well as expression' (Lord Byron and some of his Contemporaries I, p 6). In our own day Sir David Piper detects 'a very unconvincing whiff of fancy-dress ball, or Hollywood spectacular, almost Errol Flynn playing Byron' (Sir David Piper, The Image of the Poet, p 130). The Arnaout outfit was sent by Byron to Miss Mercer Elphinstone in May 1814, descending in her family to the Marquess of Lansdowne; it is now at Bowood together with Byron's letter describing it. Its dramatic discovery is recounted by Mrs Langley Moore in Byronic Dress, p 8, a lecture given at the NPG in October 1969. (1) Three-quarter-length in HM Embassy Athens (GAC 1976), canvas 127.5 x 102.0 cm signed with initials and dated 1814. Phillips's Sitter Book records: '1814 Ld Byron in Arnaut dress 379 h.l.' exhibited with 'Ld Byron for Mrs Leigh 372 k.c.'. It was exhibited RA 1814 (84) as 'Portrait of a Nobleman in the dress of an Albanian', bought from Phillips's studio in 1815 for 120 guineas by Lady Noel (Lady Byron's mother), and hung over a chimney-piece at Kirkby Mallory covered with a green curtain much to Byron's annoyance - not because of the reputation of the subject but as a precaution against smoke (note by Lady Byron in her copy of Medwin's Conversations of Lord Byron cited by Doris Langley Moore in The Late Lord Byron, 1961, p 429). It descended in the family through Byron's daughter Lady Lovelace and was bought by the Ministry of Works from Lord Lytton in 1952. It is reproduced in The Late Lord Byron, p 22 and in colour in Lord Byron in Greece, catalogue of the Arts Council exhibition in Athens 1974. (2) Half-length in NPG (NPG 142). (3) Three-quarter-length in John Murray's Byron Room, 50 Albemarle Street, London, small copy on wood panel 46.0 x 35.2 cm painted for Murray in 1840. The letter commissioning it is dated 14 December 1835: 'I should be very glad to give Fifty Guineas for a copy by you, of the Albanian Portrait of Byron, in a very small size - say like my portrait of Scott by Newton, or your own most happy one of Sir H. Englefield. I wish to have a line engraving made from it to prefix to a splendid edition of Childe Harold which I have in preparation, and if you can obtain the exclusive permission to make a large Engraving from the Original Picture I should have no hesitation in undertaking to pay the whole of the expenses of it and in accounting to you for half the profits' (Murray archive). This copy differs slightly from the original in Athens in the landscape background and by the addition of a flash of lightning in the top left corner. The head in the Arnaout type above is identical, except for moustache and head-dress, to that in Phillips's other type of which there are four versions, all half-length seated in a blue cloak, right hand on table. Which if any is the prototype is uncertain, though all (except for the Stoneleigh version which has been badly burnt) are in excellent condition. Canvas c.91.0 x 71.0 (36 x 28). Signed with initials on the front and inscribed on back of re-lined canvas: George Lord Byron/1813. This was Byron's own copy. Newstead Abbey was sold by Byron to Colonel Thomas Wildman in 1817 and at Wildman's particular request Byron 'sent his own portrait by Phillips asking him to accept it and expressing a wish that it might always hang in the Drawing Room at Newstead' (note by Ethel Webb in a Newstead guidebook of c.1885; Miss Webb's father had bought the Newstead estates after Wildman's death in 1854). Signed with initials and dated TP 1813. Presumably by descent in the family, Colonel Byron being kinsman and heir of the 11th and present Lord Byron. Colonel Byron considers that his is one of the original three versions painted in 1813. Signed and dated T.P. 1813/3. Origins and provenance uncertain but presumably the third of the portraits noted in Phillips's Sitter Book as 'December 1814 Ld Byron 3 times for Mr Murray 394 k.c.'. It appears in the Warwick Castle 1858 Catalogue as '17 of Stoneleigh', was exhibited Third Exhibition of National Portraits, South Kensington, 1868 (285) lent by Lord Leigh, and was severely damaged in a fire at Stoneleigh in 1960. Lord Leigh says that Augusta Leigh was no relation but that Byron had been a friend of his great-grandfather, Chandos Leigh, who had fagged for him at Harrow; they are said to have dined together the night before Byron sailed from England for the last time on 25 April 1816. The fagging is open to doubt, Byron was proud of having had the Duke of Dorset as his fag; and there is evidence to point to Hobhouse and Scrope Davies only having dined with Byron the night before his departure. However this may well be the portrait noted in Phillips's Sitter Book as '23 Sept 1813 Ld Byron for Mrs Leigh 372 k.c.' and exhibited RA 1814 (172) as 'Portrait of a Nobleman'. Signed and dated TP 1814. This may have been one of the two first, painted in June-July 1813 and given to Murray by Byron in November: 'The picture of Phillips I consider as mine all three - & the one (not the Arnaut) of the 2 best - is very much at your service if you will accept it as a present from yrs very truly Biron' (letter 17 November 1813; Murray's delighted acceptance is in the Murray Letter Book). However, because of the date 1814 clearly inscribed by the artist's monogram, it is possible that Phillips was dissatisfied with his earlier efforts and finally gave Murray an improved version. It became the subject of a lengthy correspondence between Byron and Murray about the engraving by Agar of which Byron's friends so disapproved. The first plate was destroyed, another commissioned and the print used for the frontispiece to the Collected Poems of 1814 (letters in Byron's Letters & Journals, ed. Leslie Marchand, IV pp 144-5, 248, 250 and 287). (4a) A copy of this was made for Peel in 1841 recorded in Phillips's Sitter Book as '8 July 1841 Lord Byron copy of Mr Murray's for Sir Robert Peel'; it is listed in the description of Drayton Manor in The Gentleman's Magazine, 1847 as a duplicate of the portrait in the possession of Lord Byron, and was sold Robinson & Fisher (Peel Heirlooms) 1 May 1900 (210). It is now at Thrumpton Hall (George Fitzroy Seymour). At least a dozen copies of Phillips's cloak portrait are recorded in the NPG archive, some on canvas of varying sizes by a variety of copyists, others as miniatures or enamels by Essex, H. P. Bone and others. Another type, said to be by Phillips, was at Sandon Hall (Earl of Harrowby), sold Sotheby's 14 July 1976 (7), half-length seated facing, head and neck slightly inclined to right, book held half-open in his right hand, left hand on wrist, shirt open at neck. Half-length to left in Arnaout costume aged 25; light blue eyes, brown hair, dark moustache (possibly introduced by the artist), fresh complexion (not pale), bluish jowl; costume mainly crimson and gold, head-dress red-gold and bluish-green, white shirt, large black jewel in brooch; purple tinge to sword-hilt; plain brown-grey cloudy background. Given to the Gallery by the artist's son Henry Wyndham Phillips 1862. 'Berlioz and the Romantic', V & A Museum, 1969; 'Byron', V & A Museum, 1974 (H8). Steel engraving c.1840 as frontispiece to Childe Harold (1841 edition).